EAST HARTFORD, Conn. — Gov. 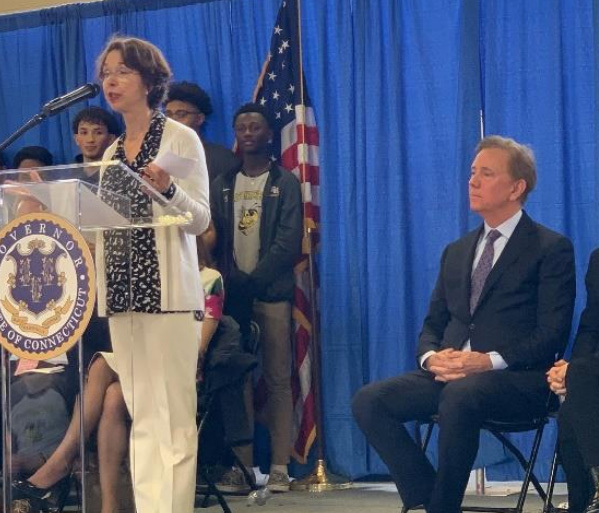 Ned Lamont announced a plan Friday to invest $300 million in private and public dollars in Connecticut’s schools — a plan centered on a $100 million contribution from hedge fund giant Ray Dalio’s philanthropic foundation. The partnership will focus funding on urban, suburban and rural districts. It will place an emphasis on public-private partnerships, programs that serve disconnected youth, as well as initiatives aimed at economic development. For example, partnerships with community-based entrepreneurs could be formed to create new mentorship programs for students, according to Lamont’s office. Nonprofits, high schools and colleges might work together to connect graduates with new jobs in cutting-edge fields. It’s never about just the “monies”. Norwalk matches salaries of surrounding wealthy towns where just about every grad secures a college degree. Less than half do. How to explain ? Just about every surrounding town parent has a college educated parent, most with major careers. But only 40% in Norwalk have college degrees and we have a 10% Poverty rate. Most of our students are non-English native speakers and many come from single parent homes w/o parents having strong careers. Clearly the home environment has a powerful influence on outcomes. Int’l comparisons show US students way down the list. Asian students commonly attend school 6 days weekly for almost 10 hours and with only a short summer vacation. And they focus on math, science, computers, etc. China is a good example of how secure modern education. Education at public schools and colleges is a good business for teachers in America. Among the highest paid in the world. With nice benefits. Job security. For many its a nice secure life. But as a nation we don’t do very well educating students from our lower income families especially those w/single parents. And unlike other advanced nations we’re not focusing on the STEM subjects nor with strong vocational training. A good example is Electric Boat in Groton. Builder of the most complex machines ever built – nuclear attack submarines. A world leader. An industry close to my heart. For decades most of their employees are secured from out of State. We don’t produce a work force sufficiently skilled. Anyway Kudos to Dalio. Money helps. Especially for our grossly underfunded public school systems in CT’s depressed major cities. But our troubles in CT education won’t be solved by monies. Much more emphasis on vocational training and STEM subjects is required. When I retired and taught grad finance at UNH for several decades most of my students were from Asia, Africa and Europe. Without exception they were crackerjacks in science and math. None ever heard of Thucydides, Iliad and few were familiar with our Bibles. Or US Constitution. But as a group they ran over the American students who were commendably “well educated”. And almost all went back to their native countries with their valuable Amerian degrees. Americans are good at finance ! China is a good example of what happens when education is taken seriously. From poor farmers to a world superpower in just a few decades. And their graduates generally speak and write English ! So it can be done. Thank you Dalio Foundation for your generosity and commitment to Connecticut education. Do we no longer acknowledge philanthropy? ” China is a good example of how secure modern education”. Really?! Yes. Students are “motivated” in other countries and flock here for many reasons.Comparing the US to anywhere else on this planet is comparing apples to oranges. We do our best to offer opportunity to everyone in this country,even to folks in Norwalk. The usual suspects are scrambling to get their share of the money.Typical Connecticut. It took just two calendar days. While I did not watch 60 Minutes, recall that Bridgewater received $52 million in “state aid” to stick around, after they failed to get a new HQ in Stamford. The headlines with the $300M are optimistic and possibly premature.